Mayor Kevin Faulconer’s proposal to eliminate building height limits near transit stations represents an acknowledgement that previous density decisions contradicted his stated housing and environmental proposals, and signals a new willingness to engage the fight with residents who oppose new housing. Mayor Kevin Faulconer announced a plan Tuesday that could dominate the political climate at City Hall for his remaining time in office. In hopes of combatting the region’s crippling housing shortage, Faulconer announced during his State of the City address that he would ask the City Council this year to eliminate building height limits near transit throughout the city, outside of coastal neighborhoods. Faulconer announced the plan while explicitly framing himself as a YIMBY – for Yes in My Backyard – a term positioned against so-called NIMBYs who oppose new development. He declared himself the city’s first YIMBY mayor. Indeed, if in 2019 San Diego struck down height limits, slashed parking minimums and allowed unlimited density to low-income projects, it would make the city among the most aggressive in the state at attacking California’s housing shortage. Those measures are each more significant — and more likely to draw opposition — than any of the smaller or neighborhood-focused reforms Faulconer has sought thus far. That’s especially true of the height limit proposal, as Faulconer understood last year when he succumbed to political pressure and backed down from a plan to increase exactly the type of height limit he’s now doing away with. Together, the reforms could elevate development fights from a handful of skirmishes in isolated neighborhoods based on discrete proposals into a full-blown citywide debate that defines local politics. If passed, the height limit proposal would let developers build more homes near transit stations, addressing both the city’s housing shortage and its commitment to decrease the share of residents who commute by car by making it easier for them to live and work near jobs and transit. But it’s also an about-face from Faulconer, who just months ago backed away from a plan to increase building heights near new stations along the $2.1 billion Mid-Coast trolley line, because neighbors rallied protested it and the district’s former Councilwoman Lorie Zapf lobbied on their behalf. The new proposal represents an acknowledgement that the decision contradicted Faulconer’s stated housing and environmental proposals, and signals a new willingness to engage the fight with residents who oppose new housing. The mayor’s decision will be cheered by environmentalists who support dense development as an alternative to sprawl, developers whose business will get a lift from it and the quieter group of residents who are fine building more homes in their neighborhoods. But the vocal and motivated group of residents who disagree, and who have for years rallied in support of height limits and against dense developments and regulatory changes that make them cheaper and easier, will now have a big, bright policy to organize against. In the past, city upzoning attempts in Carmel Valley, Hillcrest and Bay Park have run up against community-based opposition. This new citywide proposal will ostensibly affect every Council district – which could solidify the opposition into a citywide movement, or cut it off at the knees by signifying a broad responsibility for every neighborhood to make way for more homes. Faulconer’s move also comes on the heels of a Council discussion last week that would have been unheard of just a few years ago. A developer proposed a project near one of the new Mid-Coast trolley stations and was dressed down by the Council, not because the project was too dense, but because it wasn’t dense enough. Seeking to gain the community’s support, the developer compromised on the size of the project, leading the Council to criticize the company for not doing enough to combat the city’s housing shortage. The mayor’s proposal will force the Council – and its newfound Democratic supermajority – to make good on that position. If density is the goal, stripping the entire city outside the coast of height limits is one way to reach it. The coast is exempted from the mayor’s proposal because unlike the rest of the city, its height limit was enacted by voters with a 1972 ballot measure. Striking down the 30-foot coastal height limit in the area north of downtown and west of I-5 would likewise require voter approval. That’s not the case everywhere else. 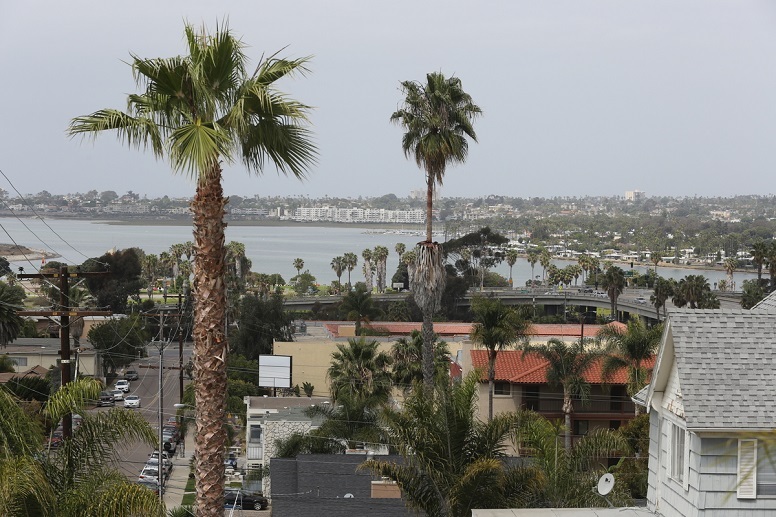 In places like Logan Heights, Uptown, North Park, Golden Hill, San Ysidro and Otay Mesa, the city has approved new development regulations aimed at encouraging new, dense development, but which nonetheless maintained height limits.. The mayor’s proposal would do away with those limits, leaving only other zoning restrictions to dictate how much a developer can build. But the mayor’s proposal would be limited to areas that are within so-called transit priority areas, or areas within a half-mile of a transit stop with high-frequency service. That means the mayor and any other Council members who get on board would be able to assure their communities that there won’t be significant changes coming to suburban cul-de-sacs that aren’t near trolley stops or the city’s major bus thoroughfares. Faulconer has now rolled out his proposal just as the race to replace him is heating up. His latest housing proposals could become a flashpoint in a mayoral race that so far has two Democratic contenders and no one from Faulconer’s Republican Party. Assemblyman Todd Gloria has long positioned himself as a champion of urban development, and even attended the YIMBY Democrats of San Diego meeting on the day that he announced his mayoral run, calling himself “the original YIMBY,” meeting attendees said. His opponent, Councilwoman Barbara Bry, has not been vocally involved in many issues directly related to height limits or home-building. She did, however, oppose the dense One Paseo project in Carmel Valley while she was running for office, and emerged as the leading figure opposing short-term vacation rentals in the city; the groups opposing short-term vacation rentals are not perfectly aligned with those who’ve organized against dense development, but there is a substantial overlap. At the same time, Democrats on the City Council are increasingly pushing for a requirement that all new developments in the city set aside 10 percent of their units for low-income residents. Currently, developers can choose instead to pay a fee into a city account used to build affordable homes. Council Republicans and the mayor have yet to warm up to that proposal. It’s likely to come up for a vote in the coming months, just as the mayor is pursuing his big moves to increase housing supply. It could become a liberal alternative to the mayor’s ideas, a bargaining chip to win Democratic votes in a broad compromise including the mayor’s YIMBY package or continue to split on partisan lines even while Democrats embrace the mayor’s deregulatory moves. Correction: An earlier version of this story included a photo with an out-of-date caption.